Hi Pat, the location is delightful, yellow is so cheery I think and with a wonderful W.C. Sparrow in there too perched nicely - great pickup! Very beautiful! Your photo gives a great sense of the depth of flowers and color around the little bird. 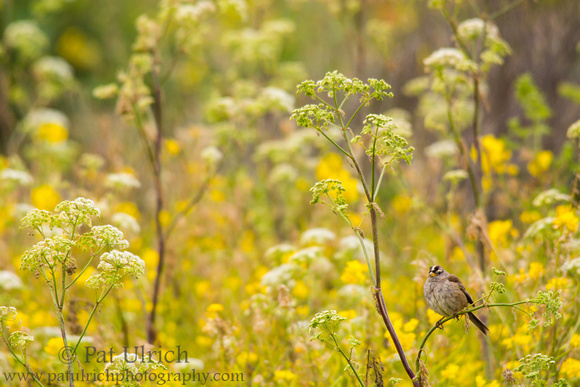 The photo worksto illustrate your point about small birds hidng in a mass of vegetation. I know exactly how you feel, it happens all the time to me. But you picked the sparrow out really well Pat.